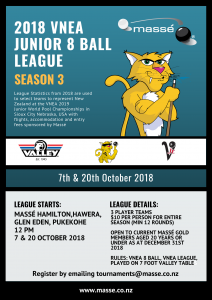 Get ready for Season 3 of the Junior VNEA 8 Ball League! This season will be played across two days. League runs in teams of 3. All juniors must play 36 frames/12 rounds. League points will be used for selection of New Zealand teams to compete at the 2019 VNEA World Junior Pool Championships in the United States! !